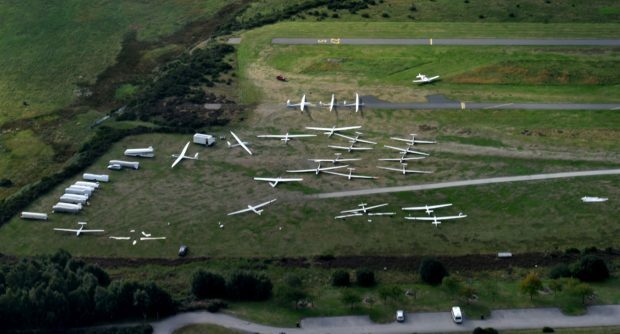 A total of 26 pilots and their gliders are competing at Deeside Gliding Club. Picture by Colin Rennie. Intrepid gliders are taking to the Aberdeenshire skies this week with their sights set on the Cairngorms – and beyond. Aircraft enthusiasts from across the UK have flown to Aboyne for the annual UK Mountain Soaring Competition. During the next week, 26 pilots are competing to fly the furthest distance and at the fastest speed over a wide range of events. Routes for the competition have included a circuit from Deeside Gliding Club across to Dufftown and Braemar. Another sent pilots across to Aviemore, Huntly and south of Nairn before heading back to base. David Innes from the Aboyne club said: “We had some people finishing the route in about two hours and 10 minutes. Every glider is fitted with a mini flight recorder ensuring that no one can fake their results, and the best flights are rewarded with prizes every day. Some have posted speeds of up to 93mph with the records made all the more impressive by the aircraft in which they have been achieved. It is rare for gliders to have engines powerful enough to allow them to take off on their own, meaning they have to be towed to help them gain the speed needed to launch. After that it is, at least partly, down to the elements to decide how the run will go. Mr Innes added: “We’ve been seeing speeds of up to 150kmh. The instructor and tug pilot also thinks that some of the records already set this week may prove unbeatable for a long time.